Before the end of this decade, Saudi Arabia could be broke… ISIS could be entrenched across the Middle East… and the cost of oil could be shockingly different from today. How do investors and interested parties cut through the media hype and the Saudis' stonewall to figure out what exactly is going on? Here's how. Renowned economic analyst John Mauldin has been getting a lot of press lately for blowing the lid off the oil story everyone has been missing. Geopolitical expert George Friedman, acclaimed for his accurate predictions, has been alerting his readers to the fact that the House of Saud is crumbling. Today, their special report reveals what the Saudi Arabian crisis means for investors worldwide. Claim your free copy right now! 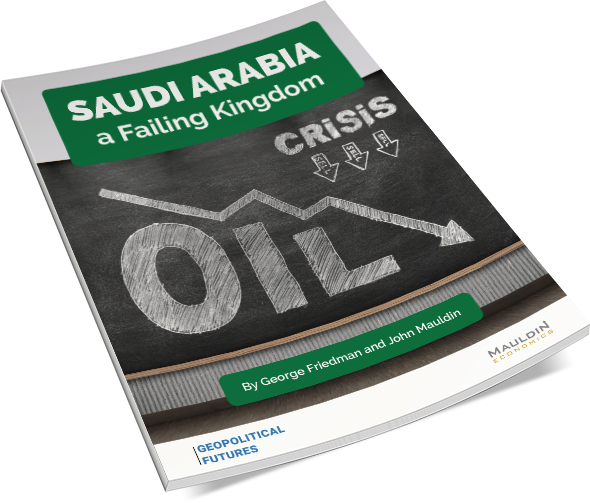 Now, this eye-opening new report, Saudi Arabia—a Failing Kingdom, lays out a roadmap for the coming years. The truth is, Saudi Arabia's state-owned oil giant, Aramco, can no longer fund the royal family's lavish lifestyle and the kingdom's proxy wars, and it can't support a heavily state-dependent populace. Add in on-the-floor oil prices, and it's clear that the House of Saud is mired in the most severe economic crisis of the last decades. Saudi Arabia—a Failing Kingdom is a must read for every investor who wants to protect their assets… and profit from what happens next. Even if you have no oil stocks in your portfolio, this report could be vitally important to prepare you for coming events. Because whenever oil and the Middle East are in play, ultimately the whole world will be affected. How the House of Saud could collapse in four years… and what it means to the region and the globe. Why the kingdom is considering an IPO of its crown jewel—after it helped drive oil prices down. How Saudi Arabia has burned through $100 billion in the last few years and why capital is fleeing the country. How the Saudis know their oil policies are opening the gates for ISIS. Why Saudi Arabia’s decisions in the Gulf will take the Middle East to the brink of disaster—and trigger a geopolitical crisis in Central Asia. What Middle Eastern oil policies mean for the future of the US shale industry… and why it matters to you. When these two brilliant minds talk, it pays to listen. Renowned intelligence and geopolitics expert George Friedman has served as foreign-policy adviser to the US government and military leaders. For decades, he has been correctly predicting world-changing events—including the EU crisis, the Ukraine conflict, and China’s economic decline. Best-selling author, financial expert, and Mauldin Economics Chairman John Mauldin is the go-to market commentator for investors and financial professionals around the globe. His writings help readers better understand Wall Street, global markets, and the drivers of the world economy. Unique Insights. From oil to beyond—John Mauldin’s Thoughts from the Frontline newsletter gives investors a sharp, clear view of the most complex situations of our times. Accurate Predictions. Is the IPO a mirage in the desert? George Friedman has a long history of accurate predictions, which you'll get entirely free with his This Week in Geopolitics newsletter. Need-to-Know Info: Whether you’re an investor, a geopolitics enthusiast, or a concerned citizen, your free access to Saudi Arabia—a Failing Kingdom, Thoughts from the Frontline, and This Week in Geopolitics will reveal all you need to know. Get Saudi Arabia—a Failing Kingdom now!